I left without make-up on, well only my lipstick. The purpose of our walk was not to find a portrait opportunity, just to take some time to get to know our surroundings and perhaps do some location scouting along the way. Late summer, warm afternoon light enhancing the richness of the details and colours of those historical buildings and churches. ‘It’s like a golden filter for everything.’ I said to Kent while admiring the Romanesque, Baroque; Gothic; Renaissance and Art Nouveau architecture. ‘Very soft this European light!’ Kent kept emphasising throughout the entire trip. Next minute, you know I was in front of his camera. No make-up on but so what? The light was just too glorious to be wasted! 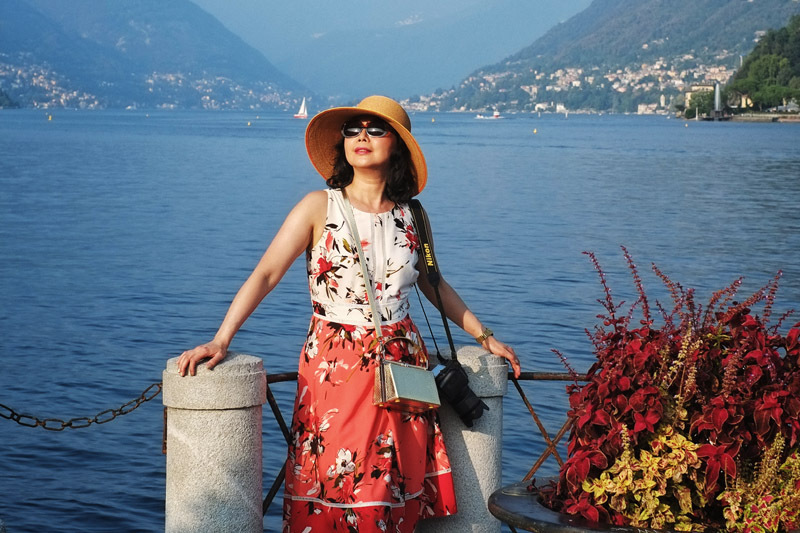 We stayed a little while enjoying people watching at Piazza del Duomo, then kept walking until we reached another lovely square – Piazza Cavour; suddenly, that famous lake was just across the lakefront drive. Facing this picturesque outlook, I was immediately struck by the blue of the lake and the sky, the greens of the trees on the foothills of the Alps; the villages in the distance and colourful villas dotting the panoramic view! Breathtaking? It’s a paradise! We kept strolling by the lakeside, there were locals walking dogs, family out to play; a few guys enjoying their fishing, people on bicycles; a hen’s party doing a group photoshoot and of course, young lovers holding hands waiting for sunset… At the same time, so calm and tranquil. 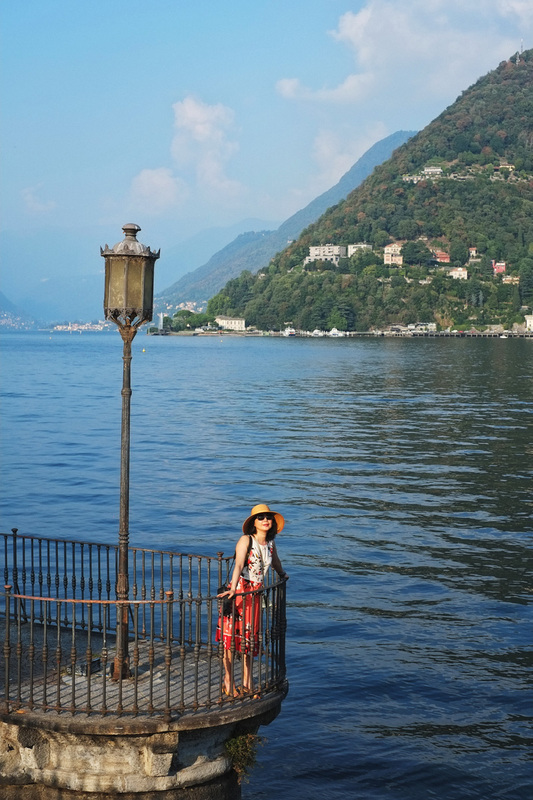 Not only does Lake Como live up to its reputation for loveliness; its stunning scenery and the serene atmosphere exceeded my expectation. 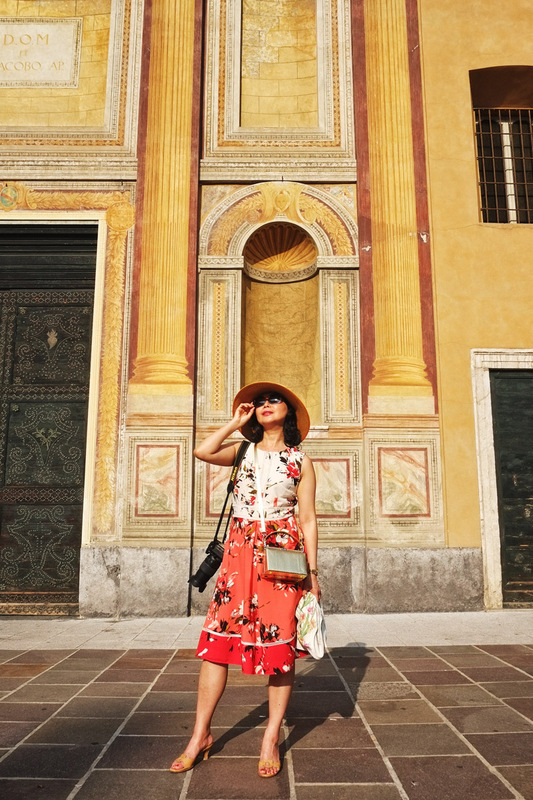 Being at the southern tip of the lake, Como and its proximity to the Alps makes this historical city a tourism destination well worth visiting. For me it was simply, the sophistication, the beauty; the peaceful pace, and my first impression of the lake from this stroll left me wanting for more. That stroll along the waterfront is lovely. Great looking out across the water but also looking back at the Palazzos too. Great spot. Lake Como is a very beautiful place and I want to visit there in the future. I love your glamorous summer outfit.